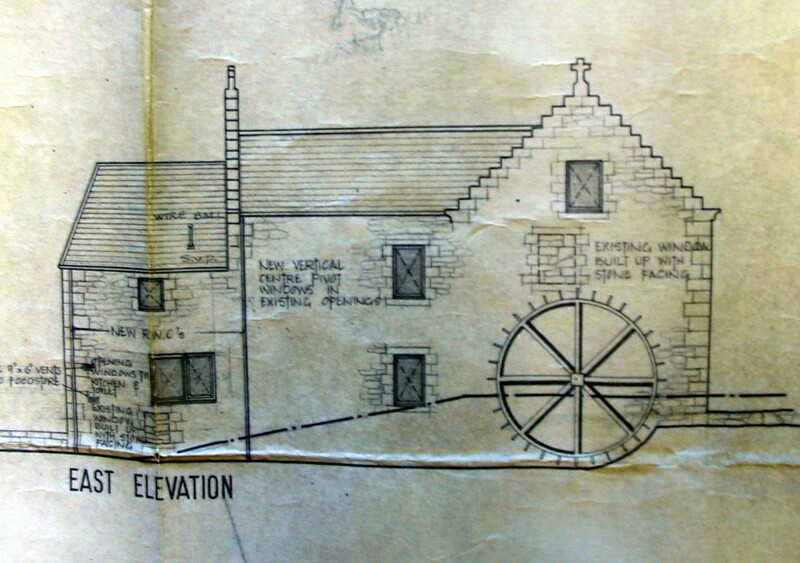 When I was just a scrap-of-a-boy my dear grandfather ‘Grumpa’ – Rab Scott of Drumdruills gave me an envelope. 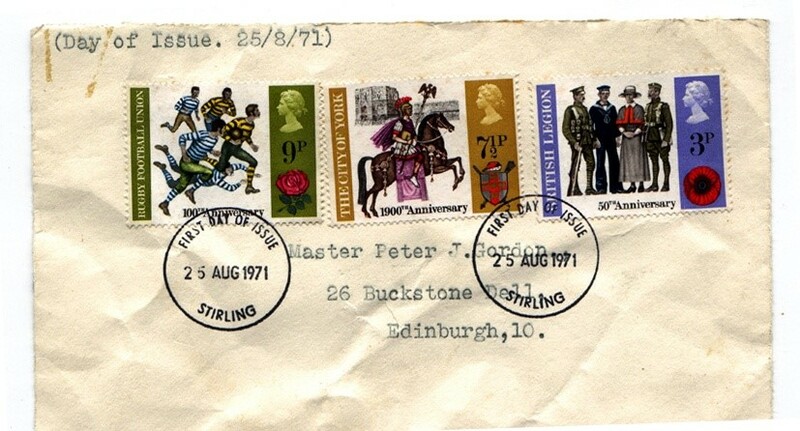 Well Grumpa was very good at getting first-day-covers (the latest issue of stamps – each with a fresh design), typing up the envelope, and posting them on to little Peter. For a year or two I got a first-day-cover every other month. Inside were handwritten notes saying how he missed his little grandson and how he felt he was getting older. These were special notes, which I now wish, that as a child, I had taken better care of. I guess you know just how that is! 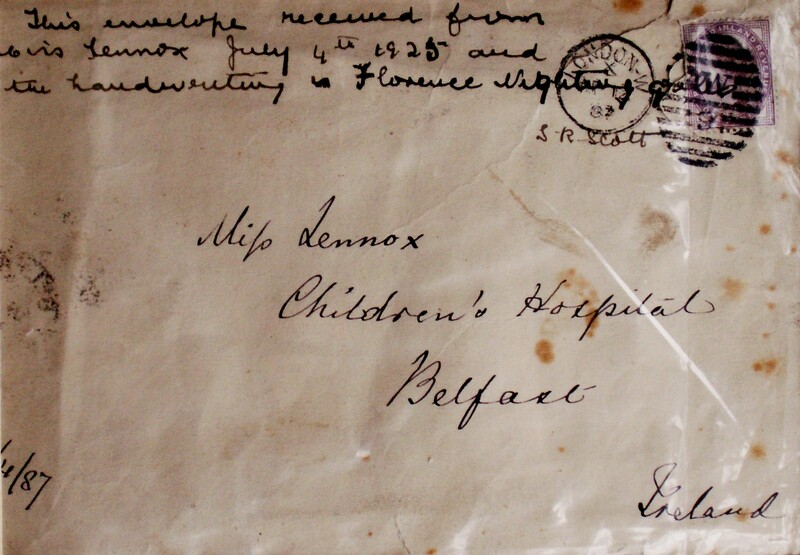 Scribbled at the top of the envelope in pen was the following “This envelope received from Miss Lennox July 4th 1925 and the handwriting is Florence Nightingales. S.R. Scott.” So it was that I started to wonder why-on-earth an envelope from Florence Nightingale had come to the Scotts; who-on-earth Miss Lennox was; and where-on-earth was the missing later. The key was starting to glow (like Biff and Chip) and another mystery was on the way?! Well that key was a slow burner for it took thirty years to open that door. The envelope, was it seems, keen to preserve its mystery. The clue to Miss Lennox came with the Rutherford letters passed on by the genial & kindly Brian Holliday. For in the bundle of 19th century letters was something rather different. Amidst the letters was a notelet written in large, bold yet flowing pen. The note was dated the 9th February 1917. 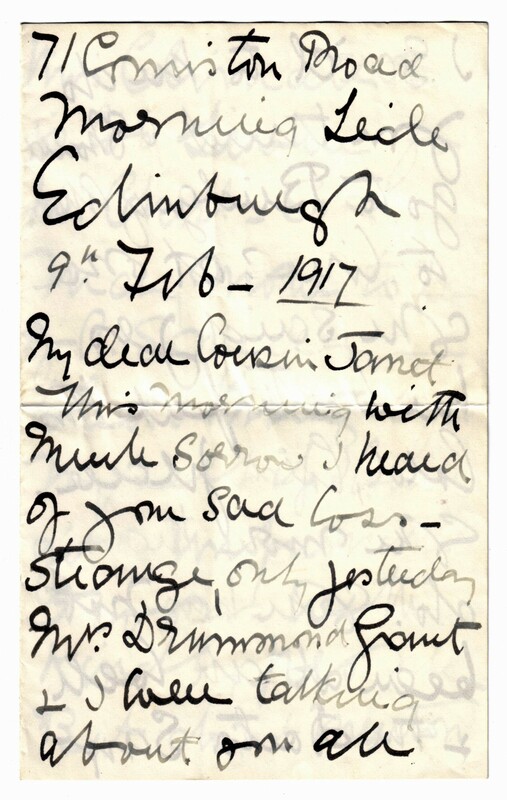 It was from Miss Lennox and addressed to her ‘dear cousin Janet.’ Miss Lennox gave her address as Morningside Edinburgh. The letter was one of sympathy to ‘cousin Janet’ expressing sorrow at the loss of her sister Margaret. This was all that I needed. Margaret was Margaret Baird who died in January 1917, the wife of Daniel McNeil Watson of Sunnylaw, who not so long before had celebrated their golden wedding anniversary. That meant that ‘dear cousin Janet’ was also a Baird, the Postmistress from Blairlogie who had married a Dawson of Drumdruills. So Miss Lennox had to be a Baird also – at least on her mother’s side. It was not too difficult to find her parents in the parish registers. 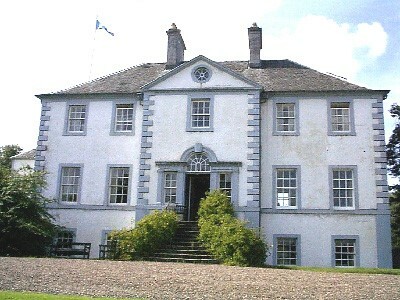 Malcolm Lennox married Janet Baird at Lecropt on the 21st February 1824. They had at least two children, Jessie (whose birth has not yet been found in the parish register) and her brother William Lennox, who according to his census return was born in ‘Bridge of Allan’ circa 1824. So let us recap. We have Jessie Lennox born (probably) in Bridge of Allan circa 1830. Her mother was Janet Baird. This Janet Baird was second daughter of William Baird and Margaret cairns. The old tombstone to William, Miller at Inverallan, can still be found in Old Lecropt. It is one of the oldest stones there. 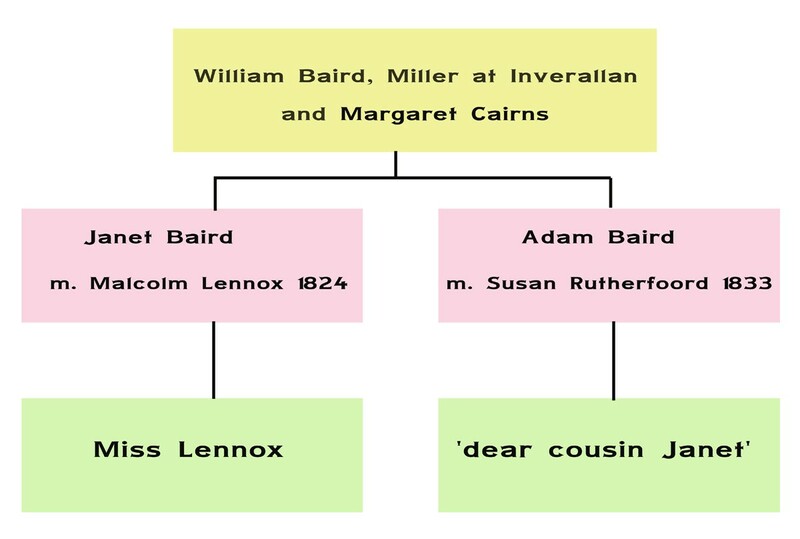 So Miss Lennox was a Baird, but why did she receive a letter from Florence Nightingale and where might that missing letter have gone? These were the questions that of course were next brought to my mind. Miss Jessie Lennox was found to have died at 9 Chamberlain Road, Holy Corner, Edinburgh on the 9th of January 1933. Her death certificate records her as aged 103 years. This immediately brought the my mind to Aunt Ena my favourite Aunt and a ‘lady of letters’ who like Miss Lennox lived to a great age and was just a day short of entering her hundredth year. So the envelope was part of a collection of letters and these letters were left in 1933 to Doctor Lilias Maclay, daughter of Lord Maclay of Duchal. The trail was getting exciting and that key red-hot! I do hope you do not mind me writing it relates to an envelope I have on my wall from Florence Nightingale. This letter led me to you. Can I explain? My name is Peter Gordon and I am a doctor in Elderly Medicine in Stirling. I am married with two small children. My grandfather, when I was small, gave me a letter from Florence Nightingale. For years it has been framed on my wall. With a bit of research I found that it was left to my grandfather by his great aunt. This Aunt was a nurse in Belfast she lived to be 103 years and was called Jessie Lennox (1830-1933). I found this out from further letters sent to my grandfather. I wonder if Lilias Maclay is of your family? Please Know I do not want the letters – far from it – I would just be interested in what they say. I hope I am not too over-familiar. This has been an exciting trail for me. Knew Livingstone and Florence Nightingale. Not a great number of people living today have had the unique privilege of knowing both of those two outstanding personalities -Dr Livingstone, the great missionary and explorer, and Florence Nightingale, the pioneer nurse and exemplar to all who have devoted themselves to the noble profession. Edinburgh has one resident who had the rare dual distinction of friendship with each of those heroic souls. This is Miss Lennox, a lady who has spent practically all her life in service to the suffering. As early as 1856, when still a girl, Miss Lennox was in Natal, South Africa, engaged in missionary work under the direction of Bishop Mackenzie, of Portmore, Eddleston, near Peebles. On the death of the Bishop, three or four years later, she came home with a party of other ladies, and in 1862 she went to the Florence Nightingale School in St. Thomas’ Hospital, London. The school, which is permanently incorporated with the Hospital, and is to this day a real, live institution, was established by the great heroine herself. A grateful public subscribed £45,000 as a thank-offering, which Miss Nightingale was to use as she wished, and this was the purpose for which she utilised the money. Miss Lennox came a great deal into touch with Florence Nightingale, who was then an invalid, as she had been ever after her self-sacrificing devotion in the Crimea. Notwithstanding the state of her health Florence Nightingale made it her duty to know all the probationers and to be informed of all that was going on in the nursing world. She was unable to leave her couch when receiving the visitors, many of whom were inspired by her kindness and love. Miss Lennox was frequently in her house, and on one occasion stayed overnight. One treasured remembrance, both of Florence Nightingale and Dr Livingstone in the possession of Miss Lennox is “Livingstone’s Last Journals,” in two volumes, on which is inscribed by the hand of the great nurse. Lord Maclay wrote back to me confirming that his cousin Martha Steedman of Mains of Blebo, Cupar, was the daughter of Dr Lilias MacLay. Later Martha telephoned to say that she recalled her mother giving the Florence Nightingale letters to her brother Patrick who was a Professor in Community Medicine. Unfortunately Patrick died suddenly whilst lecturing on River Blindness in Ougadougou in Burkina Faso. Martha wondered if her brother had left the letters to a museum, but to try and help further, contacted the widow of Patrick. The chestnut they said had stood for seventy years. were things expected of it. The tree was an obvious landmark like a hill. for adding such tiny cubits to itself. and, falling, for the first time became heavy.